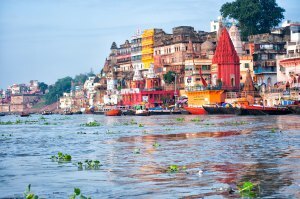 Today, called Varanasi, the ancient Benares is in India in the state of Uttar Pradesh, on a promontory on the left bank of the Ganges, and has more than 1,200,000 inhabitants. Considered one of the oldest cities in the world, it receives thousands of pilgrims who come to pray to Shiva, but it is also known for its silk production and rice cultivation. The tourists who stay here appreciate its lifestyle and its special atmosphere; One can visit its numerous gaths (wide steps on the banks of the Ganges) and sit there to observe the inhabitants wash or pray, or witness a traditional cremation from afar; Get lost in the many markets of the city and in the alleys; Have a tea while watching the sun go down. Do not miss the Golden Temple, the most sacred of the Hindu temples, with its gold leaf roof, or the temple of Hanuman (temple of monkeys) and its immense banyan in the center of the courtyard; You can also rent a boat to watch the sunrise on the Ganges, an unforgettable sight. But many say that Benares can not be visited but that she lives! Its light, the ubiquitous animals (monkeys, goats, dogs, buffalos), the majestic river, the life and the death that coexist, all combine for a very particular and striking atmosphere. You can get to Benares directly by plane from Paris (with one or two stops according to the flights), but you can also come by train from New Delhi (about 8 hours). To get around town, the rickshaws are always there, you can also rent a bike and of course walk along the river Ganges.